They say that the best deals come in small packages. Well, not for Husky. 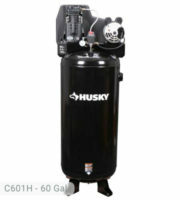 With Husky 13 gallon air compressor kit, the best deal is definitely contained in a big package. 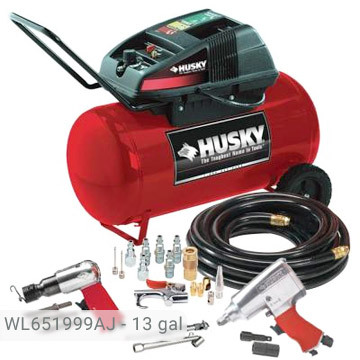 In addition to the air compressor, the bonus kit includes the following: 1/2 ft. impact wrench, air hammer, 25-feet. air hose, flip socket and extension, and a 17-piece accessory kit. You have all the things that you need for a simple home or auto project. This kit is the perfect addition to your collection of home equipment. What more can you ask for? Aside from the quantity, the kit also boasts of its quality. 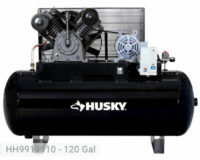 The Husky 13 gal air compressor has 1.7 running HP motor. To reinforce the high-output motor, a Campbell Hausfeld pump is installed with an air delivery of 3.8 SCFM at 90 psi. Your long list of household projects will be completed in no time. The unit pumps quickly which makes it ideal for use in different applications. The tank has a 13 gallon capacity that is perfect both for garage and industrial use. It can power tools such as your grinder and nail set. You can easily change tires by simply pushing a single button to take off the lug bolts. Filling tires and using an air chisel to cut and shape bricks can be quickly performed. The tank refills quickly allowing you to finish medium-duty tasks in less than an hour. This model can be used by anyone because of its control panel which offers a complete control of air manipulation. It can be easily read, has a gauge protection, and has no hot surfaces. Included in the package is an air tool matching start that gives concise information on which tool is best to use for a specific job. The storage box where you can keep your accessories is also convenient for the user. It will save you the time of locating all the accessories because you can place them all in just one accessory storage. Indeed, this is one of the most user-friendly compressors in the market. 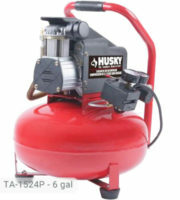 Husky 13 gal air compressor has oversized wheels so it is very portable. You can tilt the machine and roll it along any surface. For home owners who want to avoid back pains from carrying around a heavy equipment, this portable machine is specifically designed for you. It only weighs 80 lbs. which is lighter than other models with the same tank capacity. 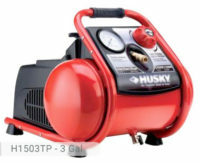 Considering that it is an oil-free air compressor, it works quietly relative to other models. The wrench and the hammer are top-quality products. All the accessories are made from durable materials so expect an extended life for your machine. They come in handy especially during emergency purposes when your tool box is not with you. 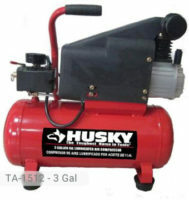 Husky 13 gallon air compressor kit assures you of ease in operations and maintenance. For a package that comes with very reliable materials, the cost of the compressor kit is certainly justified. For DIY people who are always on-the-go, this one’s for you. If you already own Husky WL651999AJ model or just want to buy it, feel free to share your review or ask a question through the form below.